2010 and 2012- Recipient of the Orange County Five Star Real Estate Agent award. Given to fewer than 7% of the real estate agents in Orange County based on research with clients. 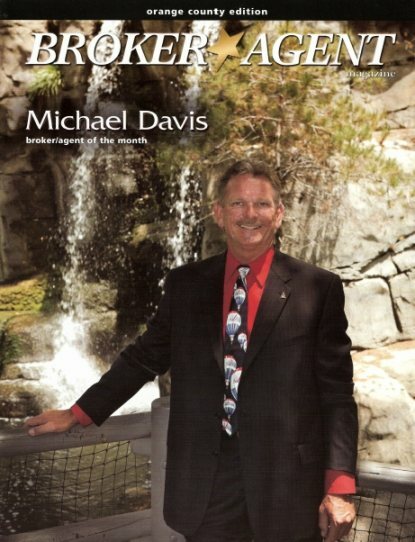 2007- Recipient of the Broker/Agent Magazine Realtor of the Month for Orange County. Honored by his Real Estate peers from Pacific West Association of Realtors, with a membership of 14,992 real estate agents recognized Michael for being a top-notch Real Estate Agent in Buena Park and surrounding areas. Michael started in the real estate industry over twenty years ago and has been a Broker/Realtor with Re/Max for sixteen years. He has received the Re/Max Platinum Club and Hall of Fame awards. Michael has lived in Buena Park for 23 years, and has been referred to as “Mr. Buena Park” as the ‘Go To’ realtor for buying or selling homes in Buena Park. Having sold three of the last four Mayors of Buena Park’s homes, Michael’s largest source of business comes from referrals. Clients who were so happy with the level of service received from Michael that he was referred to help a lineage of family members, friends, and business associates of original clients to achieve home buying and selling goals. Over many years with his involvement in the local community and activity in the Buena Park Noon Lions Club, where he served as General Chairman for several years during the Annual Silverado Days which raises money for charity within the community, and the Buena Park Chamber of Commerce yielded him the prestigious 2010 Americana Award for “Citizen of the Year” for Buena Park. The Americana Awards salute citizens of the year from eight cities that surround Cypress College and several community members attend to support their city's citizen of the year. Humbled by this award, it further demonstrates Michael’s commitment to Buena Park and its residents. A sociable and fun-loving person with a benevolent streak - It was Michaels’ kind heart that got him the recent recognition by the agents and brokers he works with, and that same generosity is what drives his commitment to the Buena Park community. This “can-do” attitude, Michael attributes to the steadfast Midwestern values that have made a strong impact on his outlook. During the Holiday season, Michael and his wife JoAnne ride their Harleys to participate in charity toy runs. “Knott’s Berry Farm has sponsored us for the past ten years, donating bears to local children,” he said. “We have been so grateful for their support and so pleased to share toys with the kids.” Years ago, Michael bought a handcrafted Amish Sleigh which he had especially built and painted back East then shipped to California. Michael has generously loaned the sleigh near Christmas time to local companies such as Nutri-Lite, and the Buena Park Noon Lions Club for “Santa” to ride in during the Annual “Shop for Less Fortunate Children” program at Sears, Buena Park. Santa continues the tradition every year by riding through the “Flower Tract” housing area in Buena Park in the Amish Sleigh before Christmas to hand out candy canes. The sleigh had also been used by the Buena Park Senior Center during the day, then transported to the Buena Park Chamber of Commerce’s Annual Holiday Auction and Taste of Buena Park held at the Holiday Inn at Buena Park for evening festivities. Michael didn’t become a Realtor® just to sell property though; his Midwest values of growing up in St. Louis, Missouri, and a belief in “honesty and hard work” led Michael toward a role as an advocate and educator for his clients, and someone who would develop a strong one-on-one relationship with his customers, learn their dreams and help them work toward achieving their goals. When Michael started his career in real estate in Buena Park, there were less than 500 homes to be marketed, but he chose Buena Park as his Realtor® “farm area” and began to do things differently. “I went against the grain of what you learn as a new agent,” he said. “I never asked for the business,” Instead, Michael just stocked up on scratch pads to distribute, knocked on doors, introduced himself and left. “I didn’t want people thinking, ‘Here’s that pushy Realtor®’,” he said. Instead, what happened was that he became a familiar face in the community and before long, local residents were asking questions about their Real Estate needs and supported his business by referring family members, business associates and friends. Today, even though the real estate market is volatile, he has been able to rise above due to the strong relationships gained over the years. Referrals from his clients have expanded throughout North Orange County. “As a Realtor®, maintaining open communication is still the most important avenue to understanding my clients’ wants and needs,” Michael said. “When it gets quiet, peoples’ minds tend to escalate. I keep my customers updated throughout the course of each transaction and am always available to answer their questions or address their concerns,” he said. Michael said that it’s easier to find what works within his clients’ budgets when he has a strong grasp of their buying potential. When buyers are ready to move to a home search, Michael said he takes great care in examining prospective purchases for the long-term value, comparing market conditions and neighborhood movement to help clients find the best buy for their dollars.